Beaphar Dog Flea Shampoo 250ml is fantastic way to help get rid of that annoying flea infestation to leave your dog parasite free. 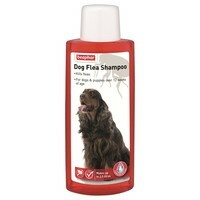 This great shampoo not only soothes the skin and coat, helping to result in a lovely clean and glossy finish, it also kills fleas immediately and stops their return for up to 7 days. The Beaphar Dog Flea Shampoo is ideal to use alongside other flea treatments to ensure your dog have been fully cleansed. Remember to treat home furnishings and your dog's sleeping areas to eliminate the whole infestation! Suitable for dogs aged 12 weeks and over. Please note: This product is only to be used on dogs. I love the smell of this shampoo, lathers well. I also find the smell lasts longer than other shampoos. This can also be mixed with water so lasts a long time. Well worth it.